Crag Knob Road, Kirkwood, Missouri. Another home by Armstrong located nearby is the Andrews Residence. The overall concept and form of the two houses are quite similar, however the McDermott Residence is a more economical, compact design using standard building materials and techniques, while the Andrews Residence is larger and more unusual. Architectural character of this home was influenced to some extent by the character of the site, which has a steep downhill slope and an excellent view. House, therefore, was oriented to face the view, with service areas and baths on the street side. The outside deck with its built-in seats is large enough for outdoor dining and entertaining, and thus takes the place of the conventional patio. The large master bedroom has its own outdoor sitting area accessible by a door. The other two bedrooms command the full view with their glass walls. The kitchen is well-planned for preparation and serving of food, and the breakfast bar forms a pass-thru for serving in the living-dining area, or on the porch. Landscaping, serpentine brick wall, and small plantings had not been completed when photographs were taken, but these have been so designed as to fit the house more closely into the site, and to make full use of the downslope of the lot to supplement the view. The is an unusually well designed, modern home, which makes use of rather conventional materials and framing methods. The contractor for the house was Kuni-Jacobsmeyer of Clayton, Missouri. Street view and floor plan. 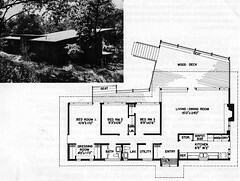 The plan of this compact house is based upon Armstrong's concept for the Missouri Solar House, developed in the late 1940s. Along the north side of the house, the smaller more utilitarian spaces are arranged. These spaces have a limited amount of glazing to hellp protect the house from cold winter winds. Only the entry is highlighted with additional glazing and a small shed dormer opposing the main single slope of the roof. The house opens toward the south with full glazing and taller walls. The roof cantilevers over the main living-dining room to protect it from the intense summer sun. The overhang is designed to keep out direct sunlight in the summer, but to admit sunlight in the winter (when the sun is lower in the sky) to provide passive solar warming of the interior. An additional benefit is brightening the interior of the house when it might be rather cold and forbidding outside. The glazing also wraps the southeast corner of the room helping to further relate the interior space to the exterior views and sunlight. The portion of glass facing toward the east would admit light into the house in the morning when the residents would be having breakfast or otherwise inhabiting the western more public portion of the house. The exterior deck is partly protected by the roof overhang (see dashed line in floor plan above). The ground slopes down offering a view into the wooded terrain providing an additional rationale for the extensive use of glazing here.